Are you ready to live your B.E.S.T. life? That’s the message I left for a therapist on one hot, humid Saturday morning in August. I had nearly passed out playing tennis with a friend in Central Park. My body was out of balance and I was scared. A lifetime of people pleasing, living up to other people’s expectations, comparing myself to others and never feeling “enough” – skinny enough, pretty enough, smart enough, funny enough, strong enough, talented enough – had led to this harrowing moment. OMG! How wrong could I be? …and so the journey to living my B.E.S.T. life began. What Does It Really Mean To Live Your B.E.S.T. Life? Along the way, the refrain “living your best life” became the signature program I use with my clients. I realized the four steps I took to make the changes I needed in my life were the same ones that worked for my clients. It isn’t always easy, but it’s definitely worth the effort. I had to learn what was really important to me. My mantra: to thine own self be true (thanks, William Shakespeare). Are you so busy living up to other people’s expectations that you’ve forgotten what is important to you? You are stronger than you think and your voice matters. Please don’t stop being you by eating your feelings. You know what happens, right? Then you are so angry at yourself that you tell yourself how “wrong” and “bad” you are. No, you’re not. You are special and fabulous. You are human. Ending emotional eating isn’t about depriving yourself of a bag of candy or cookies; it’s learning which foods are the healthiest ones for your body, mind and spirit. Let’s figure out what you need to eat to feel energized and alive (hint: bye-bye anxiety!) and which foods are going to make you want to crawl back into bed and hide under the covers all day. The awesome thing about this journey is that it is a continuous process and it keeps getting better and better. The more I learn, the more I grow. The more I grow, the bigger my dreams. The bigger my dreams, the more exciting life gets, the more fun I have, the more love I can share. Emotional eating is about more than just food. The habit can be very lonely, especially as you start to make excuses to stay at home because you don’t want to eat too much in front of your friends. And you don’t like the way your clothes fit. You don’t have to feel alone, like I did for so long. I’m here for you, to support you and guide you on the most important exploration of your life – to discover what feeds your heart and nourishes your soul. 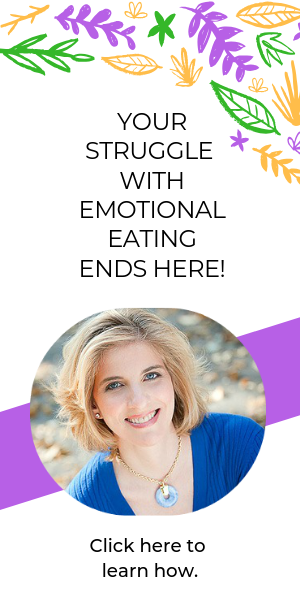 The end of your struggle with emotional eating begins here. Because everyone is unique and has different needs, I offer various options to work with me – in group programs and privately. Would it be helpful to learn more? The Work With Me/End Your Struggle page provides more information. Would it be helpful to set up a 30-minute Food Freedom Phone Conversation? There’s no charge. It’s an opportunity for us to connect, see if we’re right for each other and discuss which program would be the best for you if we choose to work together. Isn’t it time for you to Live Your B.E.S.T. Life?